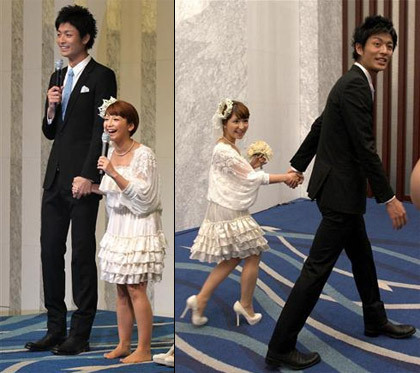 Even in 15cm-high heels, former Morning Musume member Yaguchi Mari (28) is dwarfed by her new husband, actor Nakamura Masaya (25). One of the shortest celebrities around, she is a touch less than 145cm (4’9″) tall, while he is a towering 1.92cm (6’4″). The two held a press conference in Tokyo yesterday to announce that they had tied the knot the night before. After Yaguchi returned from a Dream Morning Musume show in Hiroshima, the couple went to a municipal office around midnight to register their marriage. The two have been living together since Nakamura proposed on January 20, Yaguchi’s birthday, about a year after they started dating. They originally planned to marry in March but postponed following the Tohoku earthquake. Nakamura has visited the region as a volunteer to help with relief work. Apart from the obvious physical difference, there is also quite a gap between the two in terms of wealth. Managed by Watanabe Entertainment, Nakamura is one of the original members of the agency’s D-Boys group of actors, but only has a few supporting TV drama and movie roles under his belt. Yaguchi joined Morning Musume in 1998 as a member of the its second lineup and at the peak of their popularity. She became the group’s third leader in 2005 but had to leave just a few months later after a weekly gossip magazine published photos of her with actor Oguri Shun (28). She remained a member of the Hello! Project until 2009. She and 9 other former MoMus members formed Dream Morning Musume in January. Her bubbly personality has kept her a regular on the TV variety show circuit.